Hans Urs von Balthasar (1905—1998) was an influential, if sometimes controversial, Catholic thinker. A doctor of literature who had also studied theology and philosophy, he drew his ideas from a range of sources. Though his thinking was broadly Thomistic, he became frustrated with Scholasticism and investigated writings of figures like Hegel and Heidegger. He conducted conferences with Martin Buber and counted Karl Barth as a friend. Von Balthasar finds a similar eclecticism and creativity in Dante, whose theological aesthetics he describes in this excerpt. DANTE WROTE his major works in the vernacular in about 1300 and, in so doing, was conscious of taking a momentous step in the history of mankind. He was, of course, the inheritor of Latin scholasticism, but that tradition lay behind him. Apart from Thomas Aquinas (and even he was more of a philosopher than a theologian), . . . no theologian writing subsequently in Latin made a really significant contribution to the history of the human spirit. . . .
Dante studied the Schoolmen, just as he studied Aristotle, [Aristotelian philosophers] Averroes and Siger, but when he meets scholasticism in the heights of Paradise, in the sun, in the lowest of the “higher spheres,” the impression left on him by the round dance of the “twice twelve teachers of wisdom” (the two groups led by Thomas and Bonaventure) is of the subtle interlocking mechanism of a clock with its chimes, or of a holy mill. And so the Dominican sings the praises of Francis, and the Franciscan praises Dominic. Finally, Dante, entranced, sees a third round dance detach itself from the other two—"just as on the approach of evening new lights begin to appear in the sky so that the sight seems and seems not real.” . . . His eyes, overcome, cannot bear the sight, and Beatrice, laughing, draws him on to another sphere. 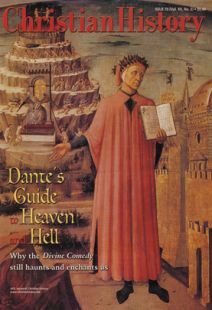 It is not inconceivable that Dante considered himself to be the originator of this new, third theology. . . .
[The Divine Comedy], inseparable both from its unique divine mission and from its historical existence, carved out like a statue or monument, Dante regarded as a venture into the new, the unknown. “I want to demonstrate truths that no one else has dared to attempt. For what kind of contribution would it be if a man were merely to prove once again a theorem of Euclid, or to demonstrate for the second time the nature of happiness, which Aristotle has already done?” And he says this at the beginning of De Monarchia! . . . There is, of course, a long tradition, both in Antiquity and in the Christian era, of journeys to the hereafter, of transcendental adventure stories and reports of ecstatic experience. However, Dante should be seen in stark contrast to this whole literary tradition because of his awareness, both theological and aesthetic, that he was setting down something that had never existed before and that in its own way is inimitable, a work that raises him high above his own age, plants him in the future, in eternity itself.